The 2007 mandates to steadily increase ethanol content in gasoline have hit yet another roadblock. Falling — instead of rising — gasoline consumption means that fuel blenders can no longer absorb the mandated ethanol quantities and still produce gasoline with no more than 10% ethanol content. Auto manufacturers strongly object to raising the ethanol content above 10%. Now, the EPA has proposed a one-time, one year waiver relaxing the 2014 mandate. A better solution would be to eliminate ethanol mandates altogether. When the 2007 ethanol mandates were passed, lawmakers were looking at forecasts of rising gasoline consumption out to 2022 and beyond. Washington reasoned that with growing gasoline consumption, mandating sharply rising ethanol content in gasoline was achievable with most vehicles using E10 gasoline. 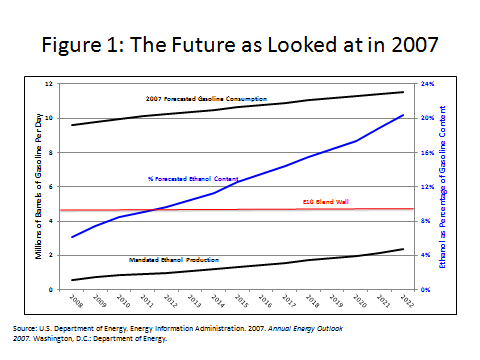 Shown on the left scale of Figure 1 was the Energy Information Administration’s (EIA) 2006 gasoline consumption forecast. The EIA predicted that 2007 gasoline consumption would rise from 9.6 million barrels per day (MMB/D) and would grow to 11.5 MMB/D by 2022 — a 20% increase. At the time of the 2007 legislation, ethanol production stood at 0.6 MMB/D – or 6% of the volume of gasoline. The 2007 ethanol mandates called for the consumption of ethanol to rise from 0.6 MMB/D to 2.35 MMB/D by 2022 (left scale on Fig. 1). This meant that by 2022, the average gasoline blend pool would contain about 20% ethanol (right axis of Fig. 1). Initially, Washington’s plan worked. Reformulated gasolines absorbed the mandated ethanol volumes that stayed under the E10 blend wall (E10). But the mandated ethanol volumes ratcheted up over time, and eventually, staying under the E10 blend wall would not be possible. With an E10 blend wall, the full volume of ethanol mandated could no longer be met. To remain compliant with the 2007 mandates, the EPA devised a clever incentive system which would force gasoline blenders to produce a mix of both E10 and E85 (85% ethanol), thus achieving the desired ethanol production target. Most consumers would buy E10, and a relatively small fraction would buy E85. Based on these forecasts if E85 flex-fuel vehicles increased to just 14% of the automobile fleet by 2022, and 86% of vehicles continued buying E10, the overall 20% blend average shown in Figure 1 would be satisfied. The regulators had struck a precarious balancing act; unfortunately, it was based upon faulty forecasts. Contrary to the forecasts, gasoline consumption has not grown as expected. Instead of increasing to 11.5 MMB/D by 2022, gasoline consumption has been declining. 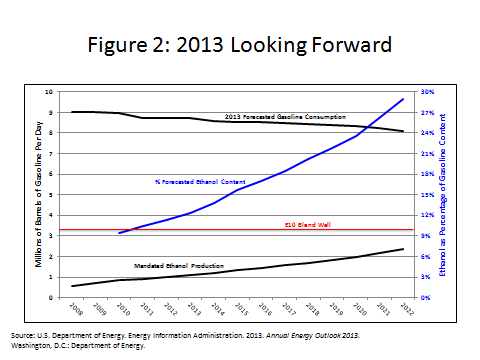 The EIA now believes that gasoline consumption will decline to 8.1 MMB/D by 2022. Figure 2 (left axis) shows the most recent EIA gasoline consumption forecast which is wildly different from the 2006 forecasts shown in Fig. 1. New more fuel efficient vehicles are making a big difference. As these new vehicles replace the older less fuel efficient vehicles, further reductions in consumption can be anticipated. But what does declining gasoline consumption imply about the percentage of ethanol in the blend pool? Fig. 2 (right axis) shows the expected percentage of ethanol content in the future gasoline blend pool. Note that the latest forecast of future gasoline consumption implies that by 2022, 28% of the gasoline blend pool must be made up of ethanol instead of the 20% based on the original forecasts. In all likelihood, the 2013 EIA gasoline demand predictions are likely to prove too optimistic about gasoline’s future. They do not factor in the substitution to natural-gas powered vehicles. Because compressed natural gas is likely to be much cheaper than gasoline, it is only a matter of time before the infrastructure is completed to allow this substitution. For example, if substitution to natural gas powered vehicles impacted only 12% of the vehicle fleet by 2022, this would further trim gasoline consumption from 8.1 MMB/D to 7.1 MMB/D by 2022. Even with this small increase in the share of natural gas powered vehicles, the ethanol content of the gasoline pool could rise to 34%, posing an even greater problem for the future viability of E10 and E85 gasoline. 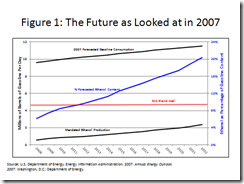 Will E85 Flex-Fuel Vehicles Save Ethanol? Even if the ethanol content of the gasoline pool rises to only 28%, it will mean that the number of vehicles using E85 must rise to 24% of the vehicle fleet (versus 14% originally forecast in 2007). If one factors in likely natural gas displacement of gasoline, the fraction of E85 vehicles would be about 31% of the gasoline-power vehicle fleet. This leads to the question: Is it realistic to assume that E85 flex-fuel vehicles will make up between 24 and 31% of the gasoline powered vehicles in 2022? To date, sales of flex-fuel vehicles capable of burning E85 have languished as a share of the total gasoline consuming vehicle fleet. In 2012, the share was only 4.7% of new vehicle sales and this was only accomplished with a variety of federal incentives to buy flex-fuel vehicles. Despite these incentives, sales of E85 were less than 100,000 barrels per day—or about 1% of total gasoline supplies in 2012. If consumers aren’t willing to buy flex-fuel vehicles, regulators have seized on the idea of raising the blend wall from a 10% maxi-mum to a 15% maximum ethanol content or from E10 to E15. Initially, this change would help to alleviate the immediate problem. Nevertheless, even if E15 were to re-place E10 as the new blend wall, E15 just delays the inevitable. Even with E15, by 2022 the percentages of E85 flex-fuel vehicles would still have to rise to between 19% and 27%. 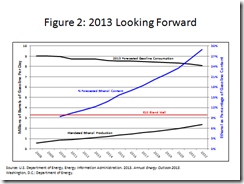 Is an E15 Blend Wall Feasible? After 2014, the mandated ethanol use in gasoline would revert back to the scheduled increases. If that happens, we see from Fig. 2, that E15 will only be a temporary stop on the way to E20 and beyond. Even though the 2007 ethanol legislation had good intentions, its intended beneficial aspects—on gasoline prices, CO2 emissions, and oil security—have been minimal. The unintended consequences on world food prices have been large and perverse. Now, with declining U.S. gasoline consumption, it is apparent that the mandates cannot even be practically met. The EPA should not and cannot be expected to solve this problem. Congressional action is needed and there is reason to be hopeful. There are several bills pending with bipartisan sponsorship. The wisest course of action is to completely dismantle the mandates and their corresponding regulatory burdens. 2 William La Jeunesse, Fox News (May 7, 2013),. 3 Hasib Nucjm, Daily Tech (July 1,2013). 4 Washington Post, “Ethanol takes policy blow from the Environmental Protection Agency,” November 17, 2013. 5 See Lucian Pugliaresi, “Up Against the Blend Wall: Examining EPA’s Role in the Renewable Fuel Standard.” June 5, 2013 testimony to the Subcommittee on Energy Policy, Health Care, and Entitlements. And all this time I thought that the purpose of the Ethanol mandate was to transfer wealth to corn producers.